Wolf Commercial Real Estate, the foremost South Jersey commercial real estate broker that specializes in South Jersey commercial real estate listings and services, is now offering premier South Jersey retail space for lease at 270 North Delsea Drive Vineland NJ. With its location in Vineland’s B-4 Zone, this South Jersey retail pad site for lease is ideal for retail operations seeking maximum exposure to thousands of potential customers daily. This retail space in South Jersey is located near the intersection of North Delsea Drive and West Park Avenue and nearly 20,000 vehicles per day pass by this South Jersey retail pad site for lease. This South Jersey retail space for lease can be acquired through Wolf Commercial Real Estate, a South Jersey commercial real estate brokerage firm that specializes in South Jersey commercial real estate listings and services. This South Jersey retail pad site for lease at 270 North Delsea Drive Vineland NJ is available for ground lease. There are +/- 2.5 acres available at this retail space in South Jersey. Call Wolf Commercial Real Estate, a South Jersey commercial real estate broker, for more information about the lease price of this highly visible retail space in South Jersey at 270 North Delsea Drive Vineland NJ. 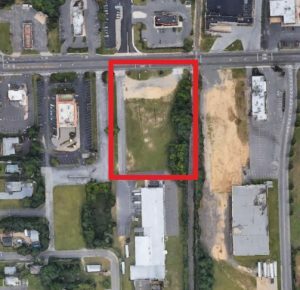 This South Jersey retail pad site for lease is near the Cumberland Mall. There are more than 63,000 potential customers living within a five-mile radius of this South Jersey retail space for lease and the average household income in that same five-mile radius of this retail space in South Jersey is $55,538. This South Jersey retail pad site for lease at 270 North Delsea Drive Vineland NJ provides accessibility to Route 40 and Route 55. This retail space in South Jersey is available through Wolf Commercial Real Estate a premier South Jersey commercial real estate brokerage firm that specializes in South Jersey commercial real estate listings and services. For more information about this South Jersey retail space for lease at 270 North Delsea Drive Vineland NJ or about any other South Jersey commercial properties for sale or lease, please contact Jason Wolf (856-857-6301; jason.wolf@wolfcre.com) or Christopher Henderson (856-857-6337; chris.henderson@wolfcre.com) at Wolf Commercial Real Estate, a South Jersey commercial real estate broker. Wolf Commercial Real Estate, a full-service CORFAC International brokerage and advisory firm, is a premier South Jersey commercial real estate broker that provides a full range of South Jersey commercial real estate listings and services, property management services, and marketing commercial offices, medical properties, industrial properties, land properties, retail buildings and other South Jersey commercial properties for buyers, tenants, investors and sellers. Please any of the numerous Wolf Commercial Real Estate websites for a full listing of South Jersey commercial properties for lease or sale through our South Jersey commercial real estate brokerage firm.